LINEE (Laboratory of Information Technology for Earth and Environmental Sciences) has developed a new system for geological mapping with a tablet PC computer in the field using GIS software. In this software several new tools have been integrated using Visual Basic in the Microsoft SDK environment for programming for Windows XP. It includes support for GPS. Data and observations (in spreadsheets, notes, sketches, photos, etc.) can be georeferenced. In addition, day/hour and position (latitude, longitude and altitude) are automatically associated with the photos managed by this system. All documents and files can be recorded in a database with Microsoft Access and ESRI format database. 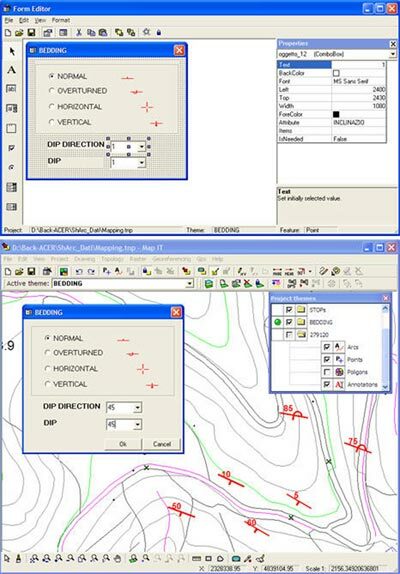 This software is designed for use by field geologists without GIS or other advanced computer experience. The idea to create a field data-capture instrument that takes advantage of the possibilities offered by Tablet PCs was born from several years of experience and hundreds of kilometres of geological and geomorphologic surveying using traditional methods for creating geological and "derivative" or applied geological maps at different scales, for regional and national mapping projects. We have found that the invaluable notebook of the geologic mapper may be substituted in most cases by the Table PC. Because we must use our computers in the field, conventional laptop and handheld computers are found to be not sufficiently durable; however, more "rugged" computers have now entered the commercial market, for use in the field. Battery life, screen display and the reduction in weight are the factors to be considered, though almost every month new models are available which improve performance, reduce operative problems, and are less expensive. Our original idea was to create a tool to be efficiently and simply used in the field by geologists who may have a limited knowledge of GIS and who want to minimize the learning time for new technologies. Moreover, the information gathered and immediately entered in the field drastically reduces the loss of information. Often data, sketches, and interpretations, which lead to a final synthesis, remain in the geologist's notebook or in their mind. In many cases, the geologists, at the end of the field project, present their work (which often consists of a piece of paper, a legend and, perhaps, illustrative notes and sections) to the director or coordinator of the study; this person certainly has not been at each location in the mapped area visited by the field geologist, and therefore does not have the ability to "weigh" the data or interpretations. For example: does a field observation have a regional value or is it merely linked to an incidental location? If one knows the geographic path and thought processes of the geologist, it is easier to answer this question. Map IT is developed in MS Visual Basic. Its principal functions are: editing cartography, georeferencing, coordinate conversion, database association, topological operations (topological clean-up, union, intersect, identity, clipping, erase, buffer), raster operations, construction of advanced and/or personal symbology, and import/export in the most common formats (shp, dwg, dxf, mif, mid, and the cadastral ntf). Map IT therefore offers all the essential tools of a Geographic Information System, yet is integrated in a fast and practical interface suitably familiar to people who utilize Digital-Ink technology to add or modify graphic elements in a digital map. In Map IT, the user can utilize the digital pen to select commands and write notes, sketch designs, and highlight areas directly on the map, thereby connecting the information to a geographic position. Map IT makes it possible to easily create and manage point, line, and polygonal topological elements using functionality similar to CAD for drawing, such as: snap functions, lock angles, automatically close an arc to the initial node; the possibility to insert or modify coordinates via the keyboard, and distance and area measuring tools. Also, proprietary functions have been developed (positioning via GPS, custom form creation, multimedia data collector, the ability to add annotations to the cartography or to images, etc.) which make Map IT a complete and valuable tool for those who wish to directly apply the technology of Geographic Information Systems on-site. Map IT connects to any GPS (Global Positioning System) device (Figure 1). While conducting a field mapping project, the data collector can display the current position on the Tablet PC's map image, in real time. This functionality is fundamental when a geologist is working in an area without any direct points of reference which would help pinpoint the exact position on the map. When direct points of reference are available, immediate comparison and validation of data may be made using the data furnished by the GPS. Figure 1. 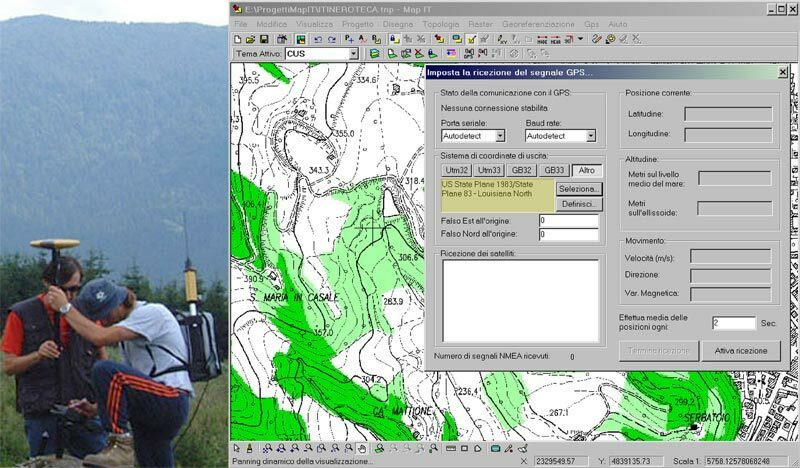 Rugged Tablet PC connected to a GPS antenna via USB or Bluetooth port and windows of Map IT for GPS connection (although the Italian-language version of the software is shown here, note the U.S. State Plane coordinate system being used). The GPS settings window of Map IT conveys information relative to the displacement of the data collector (speed and direction) and the status of the satellites. Map IT permits the user to set the interval in seconds upon which to base the positioning information from the receiver. In this way, Map IT calculates the average fix received from the GPS in a time interval specified by the user, considerably improving the data precision. With Map IT, a coordinate system different from the WGS84 used as the standard by all GPS data collectors may be defined. The data regarding the position obtained from satellites is immediately compatible with that being used by the mapping project. Once a GPS connection is established, Map IT offers the user an array of functions. For example, you can center the current display on the receiver coordinates, or, while walking, maintain the data collector's position at the center of the view while moving the map image to follow the position of the GPS. It is possible to set the Map IT plotting function to capture a path (capture the coordinates of the GPS) traversed by the data collector. In this case, Map IT offers the possibility to choose whether to capture the path data as points or arcs and whether to set a spatial tolerance (in meters) and a time period (in seconds), for capturing the spatial data. This function allows the creation, for example, of a path map of a park, simply by walking along its pathways. Selecting the Draw Point on the Map command, a point is drawn on the map in the exact position of the data collector. In this way, a point feature is instantly created with which information may be associated. This function is extremely useful when surveying the position on precise points, such as wells, manholes, etc. Moreover, it is possible to automatically label such points with a preselected cartographic symbol. Another useful tool offered by Map IT is to georeference documents that were created during a geologic mapping project. Imagine having walked over a nature path taking photos with a digital camera, writing a few annotations in a text file, or recording voice notes. Map IT automatically positions the documents in the exact position on the map in which they were created, using the date/time information of the creation of the file along with the data recorded by the GPS receiver. Thus, all activities and observations conducted during a mapping project (photographs, written notes, drawings, designs, etc.) may be automatically linked to a geographic position. Map IT can associate various geographical objects with textual information or the link to any document readable in Windows (.doc, .xls, .dbf, images, html files, etc.) via Easy Note, a tool for taking impromptu notes (Figure 2). Easy Note is activated with a rapid click on the features already present on the map or is automatically displayed when a new graphic object is added. When Easy Note appears on the screen, it is possible to write the note freehand using the digital pen or by typing text on the keyboard. Simply dragging a document inside Easy Note's yellow note window creates a link to the file from any application present on the PC. It is therefore possible to insert not only textual information, but also photos, sketches, movies, spreadsheets, HTML pages, internet links, and recordings. By hovering the cursor over a graphic object which already has associated information, the user may display the previously stored text or open the documents linked to the object. Figure 2. Screen shot of Map IT with Easy Note and Image Display windows. In the upper part of the Easy Note window you can write with a digital pen or the computer's keyboard; in the lower part of the window you can insert links to any kind of file. This "slip of paper" created by Easy Note becomes a multimedia collector of all the information that the geologist intends to associate with a graphic object. In this way, when ending a mapping project, the geologist commands a complete registration of the activities recorded and is able to profitably utilize the gathered information. Right-clicking on a file's icon, a pop-up menu appears which offers the user the possibility to open the file, view the file's properties, or remove the file from Easy Note. If the file is an image file, the pop-up menu also contains the choice to open the file in the Map IT image display (Figure 3). This simple tool was designed to instantaneously display all image files and manage them quickly and practically. The image display toolbar offers the user several functions. The zoom command enlarges (with a left-click) or reduces (with a right-click) the current display. The pan command allows the user to move the image within the window. The zoom and pan commands are dynamic; by clicking on a point in the image, the desired effect is obtained and contemporaneously the clicked area is moved to the center of the screen. The image also may be adjusted to the window size and vice versa, or may be reset to the original size. Moreover, it is possible to write comments or make sketches on the image, and to choose the colour and thickness of the sketch pen. The image is not modified since the notes are inserted as a glossy transparency that may be displayed or hidden from view. In each case, it is possible to save a copy of the image with the notes and the renderings made by the data collector. Figure 3. Image Display: you can sketch and write notes using the digital pen. Via the Map IT Form Editor tool, custom forms may be prepared that will guide and facilitate data entry during field work (Figure 4). Each time a new feature (for example, an outcrop observation) is inserted in a project theme, the appropriate form created for that feature appears, so that the data collector immediately sees the information that must be gathered. Figure 4. Form Editor shown in the upper part of the image. When you insert an element in a selected layer where you have a form, this will appear immediately (simple example of a form for bedding measurement). When creating a form, it is possible to insert labels, text fields, frames, check boxes, option buttons, combo boxes, list boxes, and action buttons. The forms and buttons can be configured; for example, text (the text displayed in the control), font (the character format of the text which appears in the control), backcolour (the background colour of the control), and left, top, width, height (the size and position of the control) can be set by the user. Attribute properties allow the user to stipulate which attributes of the feature should be associated with an object. In this way, the data collector defines the feature attributes, updating the database table records of all attributes associated with the feature. This results in a simpler and faster system: it is analogous to using a template in MS Access to fill a database table. Prior to beginning a mapping project, it is necessary to properly design it. Map IT provides the possibility to build a project on two levels. The first level is for the manager, who sets all of the characteristics of the project which the data collector will use during field work. This phase consists of the preparation of a series of geologic and base cartographic themes that will serve as the basis for the new mapping, and for defining the features and their attributes that likely will be encountered during mapping. Moreover, the manager defines the symbology of the graphic objects that the data collector must utilize. The second level is that of the mapper who physically carries out the field work. The mapper may be the manager or a different person. The mapper will work within the simplified bounds of the interface prepared by the manager for the quick insertion of information. Each time that a cartographic element is added in a theme, the appropriate form appears for the insertion of the data that must be gathered for the associated theme. Map IT brings together the "rugged field geologist" and the "GIS desk specialist", creating the role of the digital field mapper. The benefits of this new capability include more efficient and standardized workflow, and a reduced chance of losing data during the course of processing. You can find more information and contacts at http://www.uniurb.it/ISDA/MAPIT/index.htm. Akciz, S.O., Sheehan, D.D., Niemi, N.A., Nguyen, H., Hutchison, W.E., Carr, C.E., Hodges, K.V., Burchfiel, B.C., and Fuller, E., 2002. What does it take to collect GIS data in the field? (abstract): Geological Society of America Annual Meeting, Abstracts with Program, p. 185-29, http://www.geosociety.org/meetings/2002/. Brimhall, G.H., and Vanegas, A., 2001, Removing Science Workflow Barriers to Adoption of Digital Geological Mapping by Using the GeoMapper Universal Program and Visual User Interface, in D.R. Soller, ed., Digital Mapping Techniques '01—Workshop Proceedings: U.S. Geological Survey Open-file Report 01-223, p. 103-114, available at http://pubs.usgs.gov/of/2001/of01-223/brimhall.html. Briner, A.P., Kronenberg, H., Mazurek, M., Horn, H., Engi, M., and Peters, T., 1999, Fieldbook and geodatabase-tools for field data acquisition and analysis: Computers & Geosciences, v. 25, no. 10, p. 1101-1111. 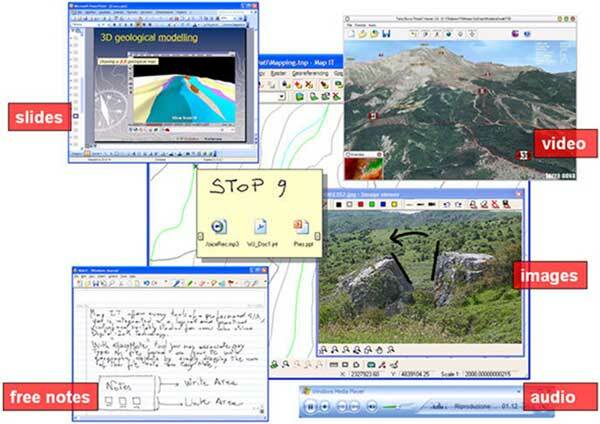 Brodaric, B., 2004, The design of GSC FieldLog: ontology-based software for computer aided geological field mapping: Computers & Geosciences, v. 30, no. 1, p. 5-20. Carver, S., Heywood, I., Cornelius, S., and Sear, D., 1995, Evaluating field-based GIS for environmental modelling, characterisation and decision support: International Journal of Geographical Information Systems, v. 9, no. 4, p. 475-486. Howard, A.S., 2002, Capturing digital data in the field -The British Geological Survey’s SIGMA Project: digital field data capture in a corporate context, in Proceedings of Capturing digital data in the field Workshop 2002, available at http://www.bgs.ac.uk/dfdc/details.html. Maerten, L., Pollard, D.D., and Maerten, F., 2001, Digital mapping of three-dimensional structures of Chimney Rock: Journal of Structural Geology, v. 23, p. 585-592. Niemi, N.A., Sheehan, D.D., Akciz, S.O., Hodges, K.V., Nguyen, H.L.Q., Carr, C.R.E., Hutchison, W.E., Studnicki-Gizbert, C., Burchfiel, B.C., and Whipple, K.X., 2002, Incorporating handheld computers and pocket GIS into the undergraduate and graduate field geology curriculum; Geological Society of America Annual Meeting, Abstracts with Program, p. 133-136, http://www.geosociety.org/meetings/2002/. Soller, D.R., ed., 2000. Digital Mapping Techniques ‘00—Workshop Proceedings: U.S. Geological Survey Open-File Report 00-325, available at http://pubs.usgs.gov/of/2000/of00-325/. Walker, J.D., and Black, R.A., 2000, Mapping the outcrop: Geotimes, v. 45, no. 11, p. 28-31.